I still love nuns and I want them back in habits. Oh yeah! Love this pic. 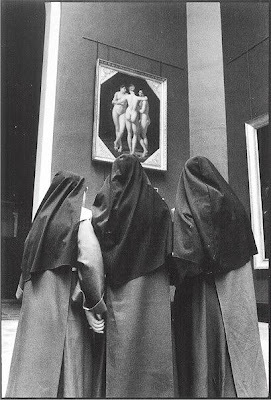 So funny to see the contrast between those nuns in full habits and the nudes. Bravo Sue! This was a great find. Zan, I think it is the "Three Graces" - will have to check. It is the THree Graces - though not Rubens' or Botticelli's or any of the others I'm familiar with. Great photo ... I love the one nun grasping the others' hand out of what? - fear? excitement? disbelief? LOL What are they thinking?????? Only one could guess, right? thanks for the smile you put on my face this morning!